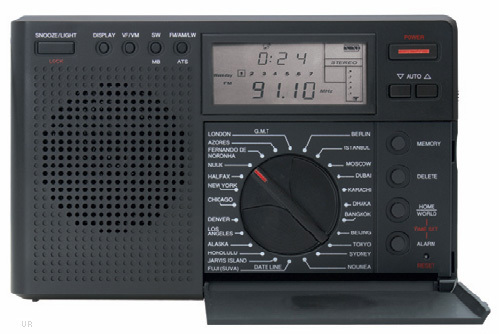 The Grundig G8 Traveler II covers longwave, medium wave, shortwave and FM bands. Shortwave coverage is: 3190-3450, 3850-4050, 4700-5100, 5700-6300, 7080-7600, 9200-10000, 11450-12200, 13500-13900, 15000-15900, 17450-17900, 18850-19100 and 21430-21950 kHz. The G8 has an analog circuit with digital display. It features a 24 hour clock with alarm that can wake you to a buzzer or to your favorite radio station. Other features include: key lock function, backlit display (momentary on), fast or slow tuning, longwave disable function, daylight savings time adjust and 9 or 10 kHz AM band step. There is also an extensive memory system that may be filled manually or automatically (ATS). The capacity is: 100 FM, 100 AM, 100 longwave and 200 shortwave frequencies. There is a built in ferrite bar antenna for longwave and medium and a telescopic whip for FM and shortwave. 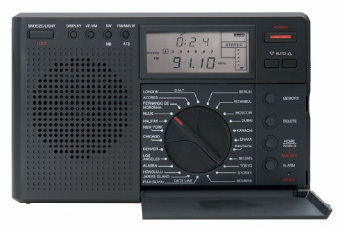 This radio even employs DSP-Digital Signal Processing technology to improve reception. Requires three AA cells (not included). Supplied with: carry pouch, stereo ear buds and manual. 6.625 x 4.125 x 1.125 inches 12.2 ounces. There is also an AC adapter jack (6 VDC 100 mA, negative). AC power supply not included. Copyright 2009-2017, Universal Radio, Inc.